A 5.6 MVA pyrometallurgical demonstration-scale pilot plant was commissioned at Mintek, South Africa, in 1994, using lead blast-furnace slag and coke as raw materials. The plant included a DC power supply, two plasma-arc furnaces and an ISP lead-splash condenser. Slags containing typically 12 per cent zinc oxide and 3 per cent lead oxide are produced as a waste during the smelting of lead in a blast furnace. These slags are a potential resource for the recovery of lead and zinc. During 1994, about 600 t of lead blast-furnace slag was processed through the pilot plant using the Enviroplas process. Zinc and lead oxides were reduced to their respective metals, volatilized, and collected in an ISP lead-splash condenser. Prime Western grade zinc, and slags disposable in accordance with current US legislation, were produced. Zinc condensation efficiencies of about 80 per cent were achieved. During the 1970s and early 1980s, Mintek installed a range of DC plasma-arc furnaces that can be operated at power levels of 10 to 500 kW. Extensive testwork has been carried out on these furnaces, to investigate the suitability of plasma-arc technology for smelting a wide variety of raw materials. Technology for ferrochromium smelting, melting of ferro-alloys, and ilmenite smelting was successfully transferred to industry. During 1993-1994, a larger pyrometallurgical demonstration plant was built at Mintek. Plasma-arc testwork at power levels of between 1 and 3 MW is usually desirable as the final step before progressing towards commercialization. The new equipment includes a 5.6 MVA power supply, two plasma-arc furnaces, and an ISP (Imperial Smelting Processes, UK) lead-splash condenser. The first testwork carried out on the demonstration plant involved the fuming of lead blast-furnace slag (LBFS) and the recovery of volatilized zinc in a lead-splash condenser. During the smelting of lead in a blast furnace, slags are produced that contain typically 12 per cent zinc oxide and 3 per cent lead oxide. Most of these slags have been dumped or stockpiled because conventional processes to clean LBFS, which are carried out in coal-fired slag-fuming furnaces, produce a fume rich in zinc oxide, and are not profitable. The Mintek EnviroplasTM process(1-3) for the treatment of zinc-containing solid wastes from the metallurgical industry could provide a cost-effective alternative method for the fuming of LBFS. 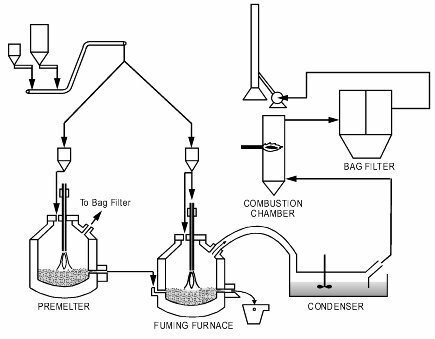 A schematic diagram of the demonstration plant is presented in Figure 1, and a photograph of the furnaces and feed system is shown in Figure 2. The basic equipment comprised a 5.6 MVA power supply, a raw material feed system, two plasma-arc furnaces, an ISP lead-splash condenser, a combustion chamber, and a gas cleaning system. LBFS was premelted in the first furnace (premelter) and hot slag was fed from the premelter, via a transfer launder and underflow weir, into the second furnace (fuming furnace). A premelter was employed for simulation of the envisaged industrial practice of feeding hot LBFS from the blast furnace, via a holding furnace, into a plasma-arc furnace. The premelter consisted of a refractory-lined cylindrical shell, a conical roof, and a small flat roof positioned on top of the conical roof. The furnace had an internal diameter of 2 m and a shell diameter of 2.5 m, giving a refractory thickness at the sidewalls of 0.25 m. Chrome-magnesite bricks were used for the hot face of the sidewalls, and the outer shell was equipped with water-spray cooling. The taphole assembly contained a water-cooled copper taphole block. Water-cooled panels were used at the conical and flat roofs, which were lined with alumina castable refractories. The flat roof contained the feed port and the central entry port for the graphite electrode (cathode), while the off-gas port was located in the conical roof. The electrode was electrically isolated from the flat roof by a plug of alumina castable refractory. The return electrode, or anode, consisted of a number of steel pins built into the hearth refractories and connected at their lower end to a steel plate, which, via radially extending arms, was linked to the furnace shell and further to the anode cable. The fuming furnace was identical in size, and the same refractories were used as in the premelter. The differences were that the fuming furnace contained two tapholes (a slag and a metal taphole) instead of one for the premelter, and an underflow weir was built into its shell to receive molten slag. The premelter and fuming furnaces were connected via a water-cooled steel channel and a refractory-lined underflow weir, for continuous transfer of hot slag. The underflow weir contained a water-cooled copper panel to extend refractory life in this critical area. The fuming furnace was linked to the lead-splash condenser through a relatively short refractory-lined elbow. This duct had an internal diameter of 300 mm and its length, measured along the axis, was about 2 m.
The lead-splash condenser was a smaller version of the ISP condensers that are employed, at several plants world-wide, in combination with an Imperial Smelting Furnace (ISF) for the smelting of mixed zinc and lead sinter. The condenser assembly consisted of the condenser body with a single rotor, the lead circulation pump, the cooling launder with immersible cooling pins, and the zinc separation bath. The condenser body was basically a steel box, about 2 m wide, 4 m long and 2 m high, lined with refractory bricks. A variable-speed rotor was inserted through the cast refractory roof. The whole assembly occupied a space of approximately 5 m by 5 m The condenser contained 21 t (metric ton, 1000 kg) of lead and was designed for a maximum zinc condensing rate of 350 kg/h. The off-gas system behind the condenser comprised a refractory-lined combustion chamber, water-cooled ducting, a 'trombone' gas cooler, a reverse-pulse bagfilter, a fan and a stack. The designed gas flowrate of the bagfilter was 27000 Nm3/h. A second bagfilter with a fan capacity of 6500 Nm3/h was connected to the premelter. The 5.6 MVA power supply consisted of two transformers and two rectifiers, so that the facility could be operated with a single furnace at a maximum of 10 kA, or with two furnaces at 5 kA per furnace. The plasma-arc furnaces were fully controlled using a PC-based SCADA (Supervisory Control And Data Acquisition) system, which provided a console for the configuration of operating parameters, recipe management, alarm annunciation, and data logging. Manual or semi-automatic operation was also available. The granular LBFS was premelted in the first plasma-arc furnace (premelter) and hot slag was fed continuously from the premelter, via a transfer launder and underflow weir, into the second plasma-arc furnace (fuming furnace). Metallurgical coke was also fed to the fuming furnace through a feed port located in the roof or via the hollow electrode. The coke addition was about 30 kg per ton of LBFS. During certain periods of the smelting campaign, the premelter was switched off, the underflow was closed with refractories, and granular LBFS was fed directly to the fuming furnace. With the three units (premelter, fuming furnace, and condenser) in line, the premelter was typically operated at a power level of 650 kW (200 V, 3.25 kA), and the fuming furnace was run at about 700 kW (175 V, 4 kA). When the premelter was not used, the fuming furnace was operated at power levels of around 1.2 MW. During short periods of the campaign, the fuming furnace was run at 2.5 MW with feed rates of up to 3 t per hour. The zinc and lead oxides contained in the slag were reduced to their metals and volatilized in the fuming furnace. Residual or 'spent' slag was tapped from the fuming furnace when about 2.5 t of LBFS had been fed to the premelter, i.e. at intervals of around 2 hours. Zinc was tapped once or twice a shift from the condenser, during periods when steady operation was achieved. Drosses were regularly removed from the cooling launder, as they were generated. Gases and dust passing through the condenser were burnt in the combustion chamber and further cleaned in the bagfilter. Fumes were removed continuously from the bagfilter. To control the smelting operation, the theoretical energy requirements (kWh/t LBFS) for each furnace were calculated, and the energy losses were measured, using cooling-water flowrates and temperatures. The operating power levels of the furnaces were then determined for selected feed rates. The main control parameters to run the furnaces were the tapping temperatures, which were measured with an optical pyrometer, and the percentages of zinc in the tapped slags. It was the aim at the outset of the campaign to attain zinc levels in the final slags of below 1.5 per cent, to achieve zinc extraction figures of about 90 per cent. The designed tapping temperatures of the premelter and fuming furnace were 1300 and 1450oC respectively. These temperatures were selected to minimize zinc losses in the premelter, to ensure sufficient fluidity, and to achieve a high degree of zinc extraction. During the campaign, gradual changes were made to the 'setpoints' of energy losses and specific energy requirements to attain the desired tapping temperatures. The general rules for operation of the condenser and its cooling system were based on temperature control around 500 oC. When the pump sump temperature was too high (or low), the lead pump speed was increased (or decreased). When the return launder temperature was too high (or low), the cooling pins were immersed (or withdrawn). Propane burners were also used when the launder temperature was too low. The temperature of the gas entering the condenser was monitored. In order to maintain a sufficiently high temperature (1000 to 1100 oC), air was sometimes introduced to the off-gas, where it combusted the CO, with the evolution of energy. Control parameters other than temperature were pressure, rotor speed, and rotor immersion. The pressure in the condenser was kept slightly positive (around 5 mm H2O), to avoid ingress of air, which could oxidize the zinc vapour and cause accretions. The Mintek Enviroplas process for the treatment of zinc-containing waste materials is based on the carbothermic reduction, at high temperatures, of selected metal oxides present in the waste materials. The process is carried out in a plasma-arc furnace, and the main objectives are to produce disposable slag and to recover metallic zinc in a lead-splash condenser, at minimal operating costs. A preliminary indication of the processing conditions most likely to meet the three main objectives was obtained from process modelling calculations carried out using Mintek's Pyrosim program(4). For example, the fuming furnace was modelled as a three-phase (gas, slag, and metal) equilibrium system. The multi-phase multi-reaction equilibrium calculations were performed using the technique of free-energy minimization, and the non-ideal behaviour of the slag and metal phases was taken into account using the Ideal Mixing of Complex Components (IMCC) model(5). It was found that about 320 kWh per ton of LBFS is theoretically required to melt the slag and raise its temperature to 1300 oC. For the extraction of zinc in the second stage (zinc fuming furnace), around 220 kWh per ton of LBFS is required. The main operating variables in the fuming furnace were percentage coke addition and operating temperature. The addition of coke was designed to extract more than 90 per cent of both the zinc and lead from the slag, while minimizing the reduction of iron oxide. 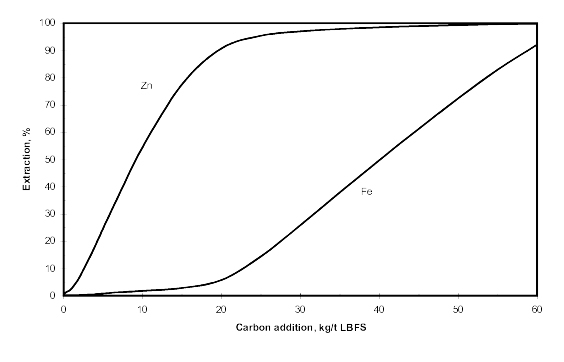 Most of the zinc is removed from the slag, and very little iron is theoretically produced at a temperature of 1450 oC and a carbon addition of about 20 kg per ton of LBFS (as shown in Figure 3). The advantage of this selective reduction is that carbon and energy are saved, and that less CO is generated (smaller gas-handling system) than when the iron oxides are completely reduced. However, a CO-to-CO2 volume ratio in the range of 5 to 10, or even higher, should be maintained to prevent excessive back-reaction of zinc vapour with CO2. 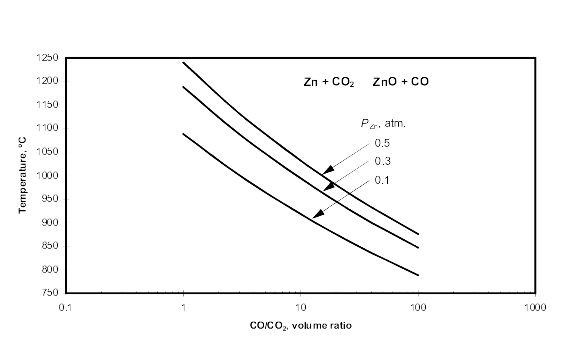 Equilibrium curves presented in Figure 4 show the temperature at which re-oxidation of zinc starts during cooling for different CO-to-CO2 volume ratios and different partial pressures of zinc in the gas stream. For example, at a CO-to-CO2 volume ratio of 10 and a partial pressure of zinc in the gas of 0.3 atmosphere, zinc oxide forms (under equilibrium conditions) at temperatures below about 1000 oC. Temperatures of around 1450 oC are required to drive the zinc and lead reduction reactions substantially towards completion, and to ensure that iron metal, which is produced in relatively small quantities, can be tapped from the furnace. At much higher temperatures, the energy requirement rises significantly, and undesirable side reactions, such as vaporization of magnesium and silicon monoxide, occur. Severe refractory problems are also envisaged at temperatures above 1500 oC. The suitability of the Enviroplas process for the smelting of LBFS was demonstrated during three continuous campaigns carried out in 1994 on the 5.6 MVA pyrometallurgical demonstration plant. About 600 t of granulated LBFS was smelted, at feed rates of 1 to 3 t/h, and power levels of 1 to 2.5 MW. The chemical analyses of the LBFS and the metallurgical coke used for the testwork are given in Tables I and II. The LBFS contained 10.9 per cent ZnO and 2.5 per cent PbO. The minor constituents of key interest with regard to the production of Prime Western (PW) grade zinc were copper at 0.4 per cent, arsenic at 0.3 per cent, and cadmium at 70 ppm. Typical analyses of products are shown in Tables III and IV. * Fuming-furnace fume: fume collected in the bagfilter connected to the fuming furnace via the condenser. When comparing the analyses of the premelter slag and the feed LBFS, it can be seen that a great part of the lead and copper were removed from the LBFS during premelting. About 40 per cent of the lead input reported to the fume and metal of the premelter in a ratio of approximately 1 to 3. Also, about 40 per cent of the copper was extracted in the premelter and mainly passed into the premelter metal. Most of the cadmium reported to the fume, and some arsenic was removed to a speiss phase in the premelter. The levels of ZnO and PbO in the slags tapped from the fuming furnace were below 2 per cent and 0.2 per cent respectively during the periods that the furnace was operated at temperatures between 1400 and 1450 oC. More copper and arsenic were removed via the metal/speiss of the fuming furnace. Samples of residual slags submitted for toxicity leaching tests were found to conform to US EPA regulations for disposal. Three types of drosses were collected from the condenser, i.e. pump sump dross, flux bath dross, and separation bath dross. The dross analyses given in Table III are weighted averages for these three drosses. The total of the dross analyses, reported as oxides, is more than 100 per cent, which indicates that the drosses contained metallic lead and zinc. The zinc metal product conformed to Prime Western grade zinc specifications. Maximum levels of lead, copper, iron, and cadmium in PW grade zinc are 1.4, 0.20, 0.05 and 0.20 per cent respectively. A first zinc mass balance was performed for a selected period of fairly consistent operation, when the furnace and the condenser were on-line while the premelter was switched off (Table V). For each ton of LBFS fed to the fuming furnace, 840 kg residual slag, 53 kg furnace metal, 54 kg zinc metal, 48 kg dross, and 10 kg fume were produced. The dross contained about 60 per cent lead and 20 per cent zinc (mostly oxide, some metallic). A better drossing procedure would reduce the amount of lead/zinc metal removed with the dross, and thus also reduce the quantity of dross per ton of LBFS feed material. Another zinc mass balance was carried out for a period when continuous hot slag transfer was employed under steady operating conditions (Table VI). In this case, the quantities of products per ton of LBFS were: 820 kg residual slag, 53 kg zinc metal, 53 kg dross, 19 kg premelter fume, and 12 kg fume collected behind the condenser. Table VII shows the accountabilities and the partitioning of arsenic and copper (key elements in the production of PW grade zinc) between zinc metal, furnace metal, discard slag, dross, and fume for a selected period during which about 50 t of solid LBFS was fed directly to the fuming furnace. It can be seen that only 1.1 per cent of the arsenic and 2.1 per cent of the copper input reported to the zinc metal. Most of the arsenic and copper was captured in the furnace metal and slag, i.e. products that can be discarded and do not require recycling. Efficiency 1 = zinc metal tapped from the condenser, as a fraction of zinc in the gas leaving the furnace; zinc in gas leaving the furnace being the zinc in the feed minus the zinc in the premelter fume and the zinc in the discard slag. Efficiency 2 = zinc metal tapped from the condenser, as a fraction of the total zinc recovered behind the condenser, i.e. the zinc in the tapped zinc, the zinc in the drosses, and the zinc in the fumes collected in the bagfilter and combustion chamber. Zinc accountabilities were included in the calculation of efficiencies of zinc condensation. The masses of zinc tapped were re-proportioned to achieve 100 per cent accountabilities of zinc. Four periods of steady-state operation were selected so as to start and end with a zinc-depleted condenser. During these periods, a total of 110 t LBFS was processed and about 6.5 t of zinc was tapped from the condenser. Roughly 65 t of the 110 t of LBFS was fed as hot slag from the premelter, while about 45 t was supplied as granular 'cold' slag directly to the fuming furnace. The calculated condenser efficiency 1 was 80.8 per cent, while efficiency 2 was 78.0 per cent. It should be noted that the selected periods of 20 to 40 hours were somewhat short for the determination of accurate values of condenser efficiencies. It is further emphasised that the use of several rotors in series, as practised industrially, should increase the condenser efficiency, and that recycling of drosses and fumes should result in an overall zinc recovery of close to 90 per cent. An energy balance was carried out for the premelter for the periods when the furnace was operated uninterruptedly at power levels around 700 kW. The average energy input was 530 kWh per ton of LBFS, at a mean tapping temperature of 1275 oC. The rate of loss of energy was on average 240 kW and the calculated specific energy requirement, based on actual kWh per ton of LBFS and on energy losses, was 335 kWh per ton of LBFS. An energy balance for the fuming furnace was carried out in a similar way as for the premelter. The average energy input was 590 kWh per ton of LBFS (i.e. per ton of LBFS fed to the premelter during this period, as the feedrate of molten slag from the premelter to the fuming furnace could not be measured), at a mean tapping temperature of 1410 oC. The rate of loss of energy was 475 kW, and the calculated specific energy requirement was about 190 kWh per ton of LBFS. A preliminary analysis of the energy requirements for the production of zinc from LBFS in an industrial cleaning furnace reveals that about 2.6 kWh per kilogram of PW grade zinc is required when hot molten slag is supplied to the fuming furnace, while 7.1 kWh per kilogram is needed when cold slag is fed to the furnace. The following assumptions were made for this initial calculation: the LBFS contains 12 per cent zinc (15 per cent zinc oxide), the discard slag contains 1.5 per cent zinc, the condenser efficiency is 90 per cent, and the thermal efficiency of the fuming furnace is 80 per cent. Considering the large difference in energy requirements for treating hot and cold LBFS, and taking the energy requirement for electrowinning of zinc into account (3.5 kWh/kg Zn) it would appear to be uneconomical to produce zinc from cold LBFS, while the production of zinc from hot LBFS could possibly be competitive with the electrolytic zinc process. Of course, a full economic comparison would have to take into account all the costs involved, including those associated with the disposal of wastes. It should be borne in mind that the plasma-arc process produces Prime Western grade zinc and a disposable slag, thereby avoiding the problems of the jarosite residues generated by electrolytic processes. The zinc oxide contents of slags tapped from the fuming furnace are shown as a function of temperature in Figure 5. There is a fair degree of scatter in the measured data, as would be expected in the absence of constancy of the many process variables involved. Superimposed on the data points are two curves, for coke additions of 15 and 30 kg/t LBFS (i.e. 1.5 and 3 per cent), showing the predicted variation of zinc oxide in the slag as a function of temperature. There is an indication that tapping temperatures of between 1400 and 1450 oC are required to achieve zinc oxide levels in the final slag of below 2 per cent. Nelson et al. 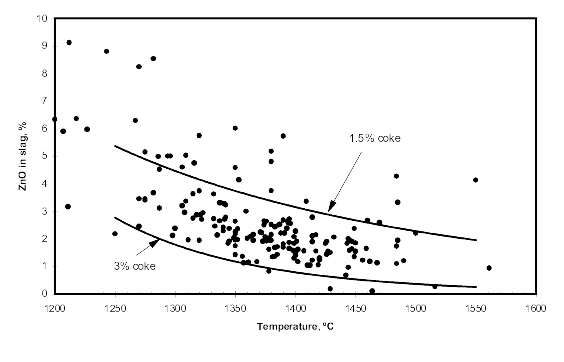 (6) investigated the kinetics of the process as a function of temperature and coke rate, and confirmed that the theoretical predictions were consistent with the measured data. Zinc fuming rates were calculated for a period of 25 taps during which 60 t of cold LBFS was fed at relatively high feed rates of about 2 t/h. The amount of zinc fumed was defined as the zinc in the slag fed minus the zinc in the residual slag. Zinc fuming rates of 120 to 180 kg/h were achieved, which corresponds with zinc volatilization fluxes of 40 to 60 kg/h/m2 (based on a hearth area of the fuming furnace of 3 m2). Extensive testwork has been carried out by Themelis et al. (7) to determine fuming rates of zinc and lead from LBFS. The application of a slag-resistance electric furnace for LBFS was investigated, and previously-published data on zinc fuming operations are presented in his paper. A comparison of these results with the zinc vaporization fluxes attained in the plasma-arc furnace suggests that some mixing of coke into the bath must have occurred in order to attain the relatively high zinc fuming rates of 40 to 60 kg/h/m2. It is believed that the liquid bath in the arc-attachment zone is moved in a downward direction by a combination of temperature gradients in the melt and electromagnetic forces, causing the injection of some coke into the bath. The degree of mixing is expected to increase at higher current fluxes prevailing in industrial plasma-arc furnaces. Complete injection of coke, according to Themelis, could generate zinc fuming rates of 150 to 300 kg/h/m2. This is an important finding with regard to the design of an industrial plasma-arc furnace for the fuming of LBFS. 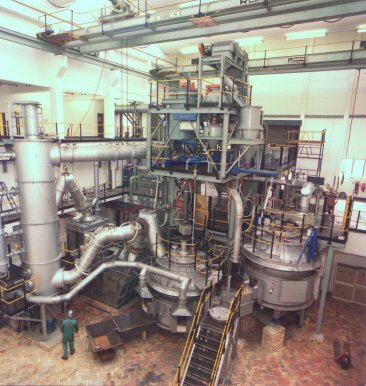 A 5.6 MVA pyrometallurgical demonstration-scale pilot plant, including a 5.6 MVA power supply, two plasma-arc furnaces, and an ISP lead-splash condenser, was successfully commissioned at Mintek in 1994. LBFS was premelted in the first plasma-arc furnace, to simulate the proposed industrial process of feeding hot slag from the blast furnace to the slag cleaning furnace. The hot LBFS was fed continuously, via a transfer launder and an underflow weir, to the second plasma-arc furnace (fuming furnace). Alternatively, solid LBFS was fed directly to the fuming furnace. About 600 t of LBFS was processed through the demonstration plant at feed rates of 1 to 3 t/h. Zinc fuming rates of 120 to 180 kg/h were achieved. Disposable slags were produced that contained less than 1.5 per cent zinc and less than 0.2 per cent lead. The zinc condensing efficiency was about 80 per cent, and Prime Western grade zinc was produced consistently. This paper is published by permission of Mintek. Assistance given by Imperial Smelting Processes Ltd (Bristol, United Kingdom), The Doe Run Company (Herculaneum, Missouri), and A.D. Zunkel Consultants Inc. (Vancouver, Washington) during the development of the process is gratefully acknowledged. 1. A.F.S. Schoukens, L.R. Nelson, and N.A. Barcza, "Plasma-arc treatment of steel-plant dust and zinc-containing slag -- theoretical and practical considerations", Recycling of Lead and Zinc the Challenge of the 1990s, Proceedings of an international conference organized by the International Lead and Zinc Study Group Sub-Committee on Recycling, Rome, June 1991, pp. 361-370. 2. A.F.S. Schoukens, F. Shaw, and E.C. Chemaly, "The Enviroplas process for the treatment of steel-plant dusts", J.S.Afr.Inst.Min.Metall., Vol.93, No.1, January 1993, pp. 1-7. 3. N.A. Barcza, C.J. Hutton, M.J. Freeman, and F. Shaw, "The treatment of metallurgical wastes using the Enviroplas process", International symposium on Extraction and Procesing for the Treatment and Minimization of Wastes, 1994 TMS Annual Meeeting, 27 February - 3 March 1994, San Francisco. 4. R.T. Jones, "Computer simulation of pyrometallurgical processes", APCOM 87, Proceedings of the Twentieth International Symposium on the Application of Mathematics and Computers in the Minerals Industries, Volume 2: Metallurgy, Johannesburg, SAIMM, October 1987, pp. 265-279. 5. R.T. Jones and B.D. Botes, "Description of non-ideal slag and metal systems by the intermediate-compound method", Proceedings of Colloquium on Ferrous Pyrometallurgy, SAIMM, Vanderbijlpark, South Africa, 8 April 1989. 6. L.R. Nelson, D.G.C. Robertson, and K. Narayama Swamy, "Kinetic simulation of the zinc fuming of lead blast furnace slags in center-fed, hollow graphite electrode, DC plasma-arc furnaces", Metallurgical processes for the Early Twenty-First Century, TMS, Warrendale, PA, 1994, pp. 283-306. 7. N.J. Themelis, J.G. Peacey, and Q. Jiao, "Recovery of zinc in a slag resistance electric furnace", H.H. Kellogg International Symposium, Quantitative Description of Metal Extraction Processes, TMS, Warrendale, PA, 1991, pp. 331-347.